Mangaluru : The inauguration of the first edition of Aloysian Literature Festival (ALF) was held on 9 February 2019 in the Robert Sequeira Hall, LCRI Block. ALF is organized by the Department of Postgraduate Studies and Research in English, St Aloysius College (Autonomous), Mangaluru. This year’s festival is envisaged with a clear thematic concern that is conservation of ecology. The inauguration began with an audio/ video representation showcasing the importance of preserving the habitats of indigenous Warli people. Principal Rev. Dr Praveen Martis, SJ inaugurated the programme. 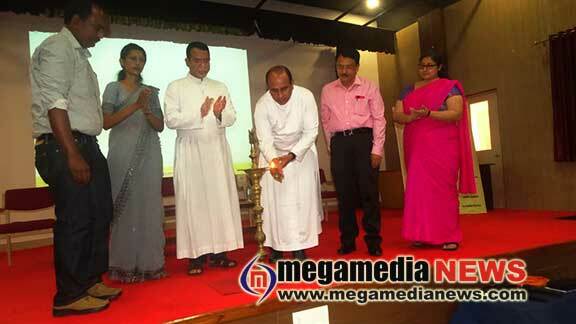 Rev Dr Dionysius Vaz SJ, Rector of St Aloysius Institutions, presided over. Rev Dr Dionysius Vaz in his presidential remark congratulated the department for organizing such a meaningful programme. He said that, due to the unplanned and the shortsighted economic growth, ecological diversity and the poor will suffer a lot. He quoted that when we are closer to nature, we are close to God. Hence, preserve the nature, culture and art which is real the wealth of our country.